The opportunity gap disproportionately impacts students of color who come from low-income backgrounds. The demographic inequalities Black and Hispanic students in the U.S. face in comparison to their White peers put them at a disadvantage before they even enter school. When combined with the educational disparities know as the achievement gap, students of color often have to overcome more challenges to have equal chance at life’s opportunities. 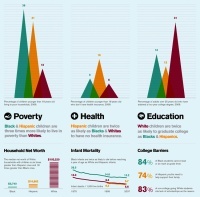 Check out the story, and full size infographic at Hispanicize.